"Bean sprout" redirects here. For the vegetables, see soybean sprout and mung bean sprout. Sprouting is the natural germination process by which seeds or spores put out shoots, plants produce new leaves or buds, or other newly developing parts experience further growth. In the field of nutrition, the term signifies the practice of germinating seeds, to be eaten raw or cooked. The term can also be used for hair growth, and in a figurative sense it can mean something appearing suddenly. All viable seeds can be sprouted, but some sprouts should not be eaten raw. Bean sprouts are a common ingredient across the world. They are particularly common in Eastern Asian cuisine. It typically takes one week for them to become fully grown. The sprouted beans are more nutritious than the original beans and they require much less cooking time. alfalfa, clover, fenugreek, lentil, pea, chickpea, mung bean and soybean (bean sprouts). sesame, sunflower, almond, hazelnut, hemp, linseed, and peanut. broccoli, cabbage, watercress, mustard, mizuna, radish, and daikon (kaiware sprouts), rocket (arugula), tatsoi, turnip). Umbelliferous vegetables (parsley family) - these may be used more as microgreens than sprouts. carrot, celery, fennel, and parsley. Allium (onions) - cannot distinguish sprouts from microgreens. Although whole oats can be sprouted, oat groats sold in food stores, which are dehulled and require steaming or roasting to prevent rancidity, will not sprout. Whole oats may have an indigestible hull which makes them difficult or even unfit for human consumption. In the case of rice, the husk of the paddy is removed before sprouting. Brown rice is widely used for germination in Japan and other countries (GBR - Germinated Brown Rice). Sprouts of the Solanaceae family (tomato, potato, paprika, aubergine or eggplant) and of rhubarb cannot be eaten raw, as they can be poisonous. Some sprouts can be cooked to remove the toxin, while others cannot. With all seeds, care should be taken that they are intended for sprouting or human consumption rather than sowing. Seeds intended for sowing may be treated with chemical dressings. Several countries, such as New Zealand, also require that some varieties of imported edible seed be heat-treated, thus making impossible for them to sprout. Quinoa in its natural state is very easy to sprout, but when polished, or pre-cleaned of its saponin coating (becoming whiter), loses its power to germinate. The germination process takes a few days and can be done at home manually, as a semi-automated process, or industrially on a large scale for commercial use. Typically the seeds are first rinsed to remove soil, dirt and the mucilaginous substances produced by some seeds when they come in contact with water. Then they are soaked for from 20 minutes to 12 hours, depending on the type and size of the seed. The soaking increases the water content in the seeds and brings them out of quiescence. After draining and then rinsing seeds at regular intervals, the seeds then germinate, or sprout. For home sprouting, the seeds are soaked (big seeds) or moistened (small), then left at room temperature (13 to 21 °C or 55 to 70 °F) in a sprouting vessel. Many different types of vessels can be used as a sprouting vessel. One type is a simple glass jar with a piece of cloth or nylon window screen secured over its rim. "Tiered" clear-plastic sprouters are commercially available, allowing a number of "crops" to be grown simultaneously. By staggering sowings, a constant supply of young sprouts can be ensured. Any vessel used for sprouting must allow water to drain from it, because sprouts that sit in water will rot quickly. The seeds swell, may stick to the sides of the jar, and begin germinating within a day or two. Another sprouting technique is to use a pulse drip method. The photo below on the right shows crimson clover sprouts grown on 1/8" urethane foam mats. It's a one-way watering system with micro-sprinklers providing intermittent pulses of fresh water to reduce the risk of bacterial cross-contamination with Salmonella and E. coli during the sprouting process. Crimson clover sprouts grown on 1/8" urethane foam mats with a pulse drip technique. Four micro-sprinklers cycle pulsing continuously over a 7-day period, each putting out about 1/2 gallon per hour. The four micro-sprinklers were each fitted with an LPD to keep the lines fully charged between pulses. Sprouts are rinsed two to four times a day, depending on the climate and the type of seed, to provide them with moisture and prevent them from souring. Each seed has its own ideal sprouting time. After three to five days the sprouts will have grown to 5 to 8 centimetres (2 to 3 in) in length and will be suitable for consumption. If left longer they will begin to develop leaves, and are then known as baby greens. A popular baby green is a sunflower after 7–10 days. Refrigeration can be used as needed to slow or halt the growth process of any sprout. Mung beans can be sprouted either in light or dark conditions. 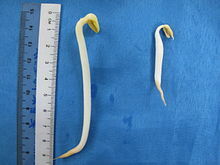 Those sprouted in the dark will be crisper in texture and whiter, as in the case of commercially available Chinese Bean Sprouts, but these have less nutritional content than those grown in partial sunlight. Growing in full sunlight is not recommended, because it can cause the beans to overheat or dry out. Subjecting the sprouts to pressure, for example, by placing a weight on top of them in their sprouting container, will result in larger, crunchier sprouts similar to those sold in grocery stores. A very effective way to sprout beans like lentils or azuki is in colanders. Soak the beans in water for about 8 hours then place in the colander. Wash twice a day. The sprouted beans can be eaten raw or cooked. Sprouting is also applied on a large scale to barley as a part of the malting process. Malted barley is an important ingredient in beer and is used in large quantities. Most malted barley is widely distributed among retail sellers in North America. Many varieties of nuts, such as almonds and peanuts, can also be started in their growth cycle by soaking and sprouting, although because the sprouts are generally still very small when eaten, they are usually called "soaks". Sprouts can be germinated at home or produced industrially. They are a prominent ingredient of a raw food diet and are common in Eastern Asian cuisine. Sprouting, like cooking, reduces anti-nutritional compounds in raw legumes. Raw lentils, for example, contain lectins, anti-nutritional proteins which can be reduced by sprouting or cooking. Sprouting is also applied on a large scale to barley as a part of the malting process. A downside to consuming raw sprouts is that the process of germinating seeds can also be conducive to harmful bacterial growth. 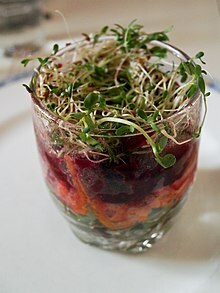 Sprouts used for a verrine. Mung bean sprouts in a bowl that have been bleached, dramatically reducing their nutritional content as is typical with store bought mung bean sprouts. See above for unbleached, natural green/white mung bean sprouts. Sprouts are rich in digestible energy, vitamins, minerals, amino acids, proteins, and phytochemicals, as these are necessary for a germinating plant to grow. These nutrients are also essential to human health. The nutritional changes upon germination and sprouting are summarized below. "The desirable nutritional changes that occur during sprouting are mainly due to the breakdown of complex compounds into a more simple form, transformation into essential constituents and breakdown of nutritionally undesirable constituents. This is a reason why sprouts are also called pre-digested foods "
"The metabolic activity of resting seeds increases as soon as they are hydrated during soaking. Complex biochemical changes occur during hydration and subsequent sprouting. The reserve chemical constituents, such as protein, starch and lipids, are broken down by enzymes into simple compounds that are used to make new compounds." "Sprouting grains causes increased activities of hydrolytic enzymes, improvements in the contents of total proteins, fat, certain essential amino acids, total sugars, B-group vitamins, and a decrease in dry matter, starch and anti-nutrients. The increased contents of protein, fat, fibre and total ash are only apparent and attributable to the disappearance of starch. However, improvements in amino acid composition, B-group vitamins, sugars, protein and starch digestibilities, and decrease in phytates and protease inhibitors are the metabolic effects of the sprouting process." Very complex qualitative changes are reported to occur during soaking and sprouting of seeds. The conversion of storage proteins of cereal grains into albumins and globulins during sprouting may improve the quality of cereal proteins. Many studies have shown an increase in the content of the amino acid Lysine with sprouting. An increase in proteolytic activity during sprouting is desirable for nutritional improvement of cereals because it leads to hydrolysis of prolamins and the liberated amino acids such as glutamic and proline are converted to limiting amino acids such as lysine. In sprouted barley, crude fibre, a major constituent of cell walls, increases both in percentage and real terms, with the synthesis of structural carbohydrates, such as cellulose and hemicellulose. Chung, et al. (1989) found that "the fibre content increased from 3.75% in unsprouted barley seed to 6% in 5-day sprouts." Source: Cuddeford (1989), based on data obtained by Peer and Leeson (1985). Increase of protein is not due to new protein being manufactured by the germination process but by the washing out of starch and conversion to fiber—increasing the relative proportion of protein. An increase in lipase activity has been reported in barley by MacLeod and White (1962), as cited by Chavan and Kadam (1989). Increased lipolytic activity during germination and sprouting causes hydrolysis of triacylglycerols to glycerol and constituent fatty acids. According to Chavan and Kadam (1989), most reports agree that sprouting treatment of cereal grains generally improves their vitamin value, especially the B-group vitamins. Certain vitamins such as α-tocopherol (Vitamin-E) and β-carotene (Vitamin-A precursor) are produced during the growth process (Cuddeford, 1989). Sprouts provide a good supply of Vitamins A, E & C plus B complex. Like enzymes, vitamins serve as bioactive catalysts to assist in the digestion and metabolism of feeds and the release of energy. They are also essential for the healing and repair of cells. However, vitamins are very perishable, and in general, the fresher the feeds eaten, the higher the vitamin content. The vitamin content of some seeds can increase by up to 20 times their original value within several days of sprouting. Mung Bean sprouts have B vitamin increases, compared to the dry seeds, of - B1 up 285%, B2 up 515%, B3 up 256%. Even soaking seeds overnight in water yields greatly increased amounts of B vitamins, as well as Vitamin C. Compared with mature plants, sprouts can yield vitamin contents 30 times higher. The following table lists selected nutrients in kidney beans to show the effect of sprouting. Raw kidney beans contain high amounts of the toxin phytohemagglutinin, and the US Food and Drug Administration recommends boiling for 30 minutes to ensure they reach a sufficient temperature long enough to completely destroy the toxin. Nutrients are calculated for 100 grams of non-water components to remove water from the equation since after sprouting beans absorb a lot of water. Shipard (2005) claims that: "When seeds are sprouted, minerals chelate or merge with protein, in a way that increases their function." It is important to note that while these changes may sound impressive, the comparisons are between dormant non-sprouted seed to sprouted seed rather than comparisons of sprouts to mature vegetables. Comparing dry seeds to sprouts shows large increases in nutrients, whereas comparing sprouts to mature vegetables shows less of increase. However, a sprout, just starting out in life, is likely to need, and thus have more nutrients percentage-wise of weight, than a mature vegetable. Sprouting can improve levels of gamma-Aminobutyric acid (GABA), a compound involved in the regulation of blood pressure, and promoted the liberation of bioactive peptides in diverse legumes. Commercially grown sprouts have been associated with multiple outbreaks of harmful bacteria, including salmonella and toxic forms of Escherichia coli. Such infections, which are so frequent in the United States that investigators call them "sproutbreaks", may be a result of contaminated seeds or of unhygienic production with high microbial counts. Sprout seeds can become contaminated in the fields where they are grown, and sanitizing steps may be unable to kill bacteria hidden in damaged seeds. A single surviving bacterium in a kilogram of seed can be enough to contaminate a whole batch of sprouts, according to the FDA. To minimize the impact of the incidents and maintain public health, both the U.S. Food and Drug Administration (FDA) and Health Canada issued industry guidance on the safe manufacturing of edible sprouts and public education on their safe consumption. There are also publications for hobby farmers on safely growing and consuming sprouts at home. The recommendations include development and implementation of good agricultural practices and good manufacturing practices in the production and handling of seeds and sprouts, seed disinfection treatments, and microbial testing before the product enters the food supply. In June 2011, contaminated fenugreek sprouts (grown from seed from Egypt) in Germany was identified as the source of the 2011 E. coli O104:H4 outbreak which German officials had at first wrongly blamed on cucumbers from Spain and then on mung bean sprouts. In addition to Germany, where 3,785 cases and 45 deaths had been reported by the end of the outbreak, a handful of cases were reported in several countries including Switzerland, Poland, the Netherlands, Sweden, Denmark, the UK, Canada, and the USA. Virtually all affected people had been in Germany shortly before becoming ill. Some legumes, including sprouts, can contain toxins or anti-nutritional factors, which can be reduced by soaking, sprouting and cooking (e.g., stir frying). Joy Larkcom advises that to be on the safe side "one shouldn’t eat large quantities of raw legume sprouts on a regular basis, no more than about 550g (20oz) daily". Alfalfa seeds and sprouts contain L-canavanine, which can cause lupus-like disease in primates. In order to prevent incidents like the 2011 EHEC epidemic, on 11 March 2013, the European Commission issued three new, tighter regulations. Regulation (EU) No 209/2013 amends Regulation (EC) No 2073/2005 in respect of microbiological criteria for sprouts and the sampling rules for poultry carcasses and fresh poultry meat. Regulation (EU) No 211/2013 requires that imported sprouts and seeds intended for the production of sprouts have a certificate, drawn up in accordance with the model certificate in the Annex of the regulation, that serves as proof that the production process complies with the general hygiene provisions in Part A of Annex I to Regulation (EC) No 852/2004 and the traceability requirements of Implementing Regulation (EU) No 208/2013. ^ "Plant-based nutrition". Spring 2002. Archived from the original on 2004-07-28. Retrieved 2007-11-14. ^ Dikshit, Madhurima; Ghadle, Mangala (2003). "Effect of sprouting on nutrients, antinutrients and in vitro digestibility of the MACS-13 soybean variety". Plant Foods for Human Nutrition. 58 (3): 1–11. doi:10.1023/B:QUAL.0000040357.70606.4c. ^ Rumiyati; Jayasena, Vijay; James, Anthony P. (13 August 2013). "Total Phenolic and Phytosterol Compounds and the Radical Scavenging Activity of Germinated Australian Sweet Lupin Flour". Plant Foods for Human Nutrition. 68 (4): 352–357. doi:10.1007/s11130-013-0377-6. PMID 23943234. ^ Świeca, Michał; Gawlik-Dziki, Urszula; Kowalczyk, Dariusz; Złotek, Urszula (June 2012). "Impact of germination time and type of illumination on the antioxidant compounds and antioxidant capacity of Lens culinaris sprouts". Scientia Horticulturae. 140: 87–95. doi:10.1016/j.scienta.2012.04.005. ^ a b c d Chavan, J. K.; Kadam, S. S.; Beuchat, Larry R. (January 1989). "Nutritional improvement of cereals by sprouting". Critical Reviews in Food Science and Nutrition. 28 (5): 401–437. doi:10.1080/10408398909527508. PMID 2692609. ^ a b c Cuddeford, D. (1 September 1989). "Hydroponic grass". In Practice. 11 (5): 211–214. doi:10.1136/inpract.11.5.211. ^ Peer, DJ; Leeson (Dec 1985). "S". Animal Feed Science and Technology. 13 (3–4): 191–202. doi:10.1016/0377-8401(85)90022-7. ^ Chung, CT; Niemela, SL; Miller, RH (April 1989). "One-step preparation of competent Escherichia coli: transformation and storage of bacterial cells in the same solution". Proceedings of the National Academy of Sciences of the United States of America. 86 (7): 2172–5. doi:10.1073/pnas.86.7.2172. PMC 286873. PMID 2648393. ^ MacLeod, Anna M.; White, H. B. (12 November 1962). "LIPID METABOLISM IN GERMINATING BARLEY. II. BARLEY LIPASE". Journal of the Institute of Brewing. 68 (6): 487–495. doi:10.1002/j.2050-0416.1962.tb01894.x. ^ a b Shipard, Isabell (2005). How can I grow and use sprouts as living food?. [Nambour, Qld.? ]: David Stewart. ISBN 9780975825204. ^ "Food Composition Databases Show Foods -- Beans, kidney, all types, mature seeds, raw". ndb.nal.usda.gov. Retrieved 2017-06-07. ^ "Food Composition Databases Show Foods -- Beans, kidney, mature seeds, sprouted, raw". ndb.nal.usda.gov. Retrieved 2017-06-07. ^ Martínez-Villaluenga, Cristina; Kuo, Yu-Haey; Lambein, Fernand; Frías, Juana; Vidal-Valverde, Concepción (18 March 2006). "Kinetics of free protein amino acids, free non-protein amino acids and trigonelline in soybean (Glycine max L.) and lupin (Lupinus angustifolius L.) sprouts". European Food Research and Technology. 224 (2): 177–186. doi:10.1007/s00217-006-0300-6. ^ Diana, Marina; Quílez, Joan; Rafecas, Magdalena (September 2014). "Gamma-aminobutyric acid as a bioactive compound in foods: a review". Journal of Functional Foods. 10: 407–420. doi:10.1016/j.jff.2014.07.004. ^ a b c d e Neuman, William (10 June 2011). "The Poster Plant of Health Food Can Pack Disease Risks". New York Times. Retrieved 11 June 2011. ^ Breuer, Thomas; et al. "A Multistate Outbreak of Escherichia coli O157:H7 Infections Linked to Alfalfa Sprouts Grown from Contaminated Seeds". Retrieved 19 November 2007. ^ Gabriel, Alonzo A.; Berja, M; Estrada, A; Lopez, M; Nery, J; Villaflor, E; et al. (2007). "Microbiology of retail mung bean sprouts vended in public markets of National Capital Region, Philippines". Food Control. 18 (10): 1307–1313. doi:10.1016/j.foodcont.2006.09.004. ^ Food and Drug Administration (May 17, 2005). "Transcript of Proceedings of Public Meeting on Sprout Safety". Retrieved 19 November 2007. ^ Health Canada (2007-01-15). "Sprouted Beans and Seeds". Retrieved 19 November 2007. ^ Harrison, H. C. "Growing Edible Sprouts at Home" (PDF). Retrieved 5 September 2016. ^ Suslow, Trevor V.; Linda J. Harris. "Growing Seed Sprouts at Home" (PDF). Retrieved 23 November 2007. ^ a b c d e f g h "Outbreak of Shiga toxin-producing E. coli in Germany (22 June 2011, 11:00)". ECDC. 22 June 2011. Archived from the original on 30 June 2011. Retrieved 22 June 2011. ^ "E. coli cucumber scare: Russia announces import ban". BBC News Online. 30 May 2011. Archived from the original on 30 May 2011. Retrieved 30 May 2011. ^ "E. Two in U.S. infected in German E. coli outbreak". MSNBC Online. 31 May 2011. Retrieved 2 June 2011. ^ Douglass, Joy Larkcom ; illustrated by Elizabeth (1995). Salads for small gardens (2nd ed.). [London]: Hamlyn. ISBN 978-0-600-58509-1. ^ Natural Antinutritive Substances in Foodstuffs and Forages (1 ed.). S. Karger; 1 edition (August 28, 1968). p. 184. ISBN 978-3805508568. ^ Shipard, Isabell (2005). How can I grow and use sprouts as living food?. [Nambour, Qld.? ]: David Stewart. ISBN 978-0975825204. ^ Egli, I.; Davidsson, L.; Juillerat, M.A. ; Barclay, D.; Hurrell, R.F. (November 2002). "The Influence of Soaking and Germination on the Phytase Activity and Phytic Acid Content of Grains and Seeds Potentially Useful for Complementary Feedin". Journal of Food Science. 67 (9): 3484–3488. doi:10.1111/j.1365-2621.2002.tb09609.x. ^ Montanaro, A.; Bardana Jr, E. J. (May 1991). "Dietary amino acid-induced systemic lupus erythematosus". Rheum Dis Clin North Am. 17 (2): 323–32. PMID 1862241. Safron, Jeremy A. (2003). The raw truth : the art of preparing living foods. Berkeley: Celestial Arts. ISBN 978-1-58761-172-8. Morán, Leslie (2007). The complete guide to successful sprouting for parrots : and everyone else in the family. Silver Springs, NV: Critter Connection. ISBN 978-1-4196-8479-1. Cuddeford, D. (1 September 1989). "Hydroponic grass". In Practice. 11 (5): 211–214. doi:10.1136/inpract.11.5.211. Shipard, Isabell (2005). How can I grow and use sprouts as living food?. [Nambour, Qld.? ]: David Stewart. ISBN 978-0-9758252-0-4. Kavas, A.; Els, N. (1992). "Changes in nutritive value of lentils and mung beans during germination". Chem.Mikrobiol., Technol., Lebens. 14: 3–9. Wikimedia Commons has media related to Sprouted grains. Sprout People - A large online resource for home sprouters.